Our Green Screen Photo Booth gives every guest the ability to customize their experience so that they have the most fun. Watch our demo video of our booth and learn how our Photo Booth can embed people into scenes and give your guests something to rave about your event! 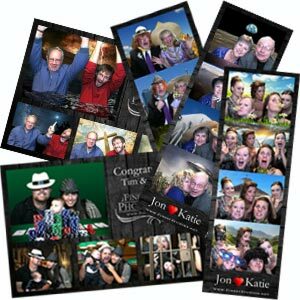 Photo booths are becoming a standard part of any great wedding reception, party, prom, family reunion, and special event. Having a photo booth at such events works to both validate the event and create something special for the guest to do. When people go home from your event with pictures of themselves having fun they will have something that will remind them of how special you made their day. Finest Studios wants to work with you to create special memories for all your guests and has labored to produce the best photo booth service in the area. Finest Studios photo booths were custom designed to fit in tight places and yet maximize the amount of fun your guests will experience. One of the most exciting features of Finest Studios photo booths is its green screen technology. A green screen photo booth is so smart that it can digitally replace the background behind the people who enter it. Utilizing this technology, your guest can be magically transported to places like the Moon, the Wild Wild West, and even under water swimming with a shark. If you want the best photo booth service in St Louis, Cape Girardeau, Ste Genevieve, Perryville, Farmington, southeast Missouri, and the surrounding area look no further than Finest Studios Photo Booths. Finest Studios Photo Booths offers the best photo booth services in southeast Missouri and beyond. No other photo booth rental services will provide you with the same amazing features and service at such competitive pricing. Keep reading to find out what makes Finest Studious Photo Booth Rental services stand out. The first time you use Finest Studios Photo Booths you’ll be blown away by what it can do. Unlike the other photo booths you may have used in the past, our photo booth utilizes a cutting edge green screen technology. This is the same technology that allowed people in movies like “The Lord of the Rings” and “Avatar” to appear like they are in different worlds even though they are actually just standing in front of a green screen. Finest Studios uses this same technology to allow you to enter the photo booth and be transported to places like the Moon or back in the Wild Wild West. In addition to our green screen, our photo booth is equipped with a touch screen display, professional softbox lighting, and water and smudge proof printing. Many photo booths today are no more than a tent with a camera in it and don’t even resemble a photo booth. However, Finest Studios’ photo booths are made to look like the old fashion photo booths from the past with some modern twists. As soon as you enter our booth, you will be greeted by a large touch screen display. On that display, you will find our custom user interface which has been meticulously created by a professional graphic designer. When you look around the booth you will also see our soft box lighting system which was made by a professional photographer. Our lighting system creates beautiful soft light that rolls off people faces, unlike the hard ugly shadows that are produced by our competition bursting flashes. Finally, even the prints our booth creates of your photo session meet the highest standards. Our photo booths use dye-sublimation technology which yields smudge-less; waterproof prints. In addition, our print layouts have been customized with high-quality backgrounds and overlays so that every print looks like a masterpiece. If you want a custom logo or text integrated into your print layouts Finest Studios will have a professional graphic designer make up something special just for your event. If you are looking for a photo booth to rent for your wedding, prom, party, family reunion, or special event Finest Studios offers the best photo booths in terms of quality and professionalism. At every event, Finest Studios will provide a friendly helpful attendant with every photo booth rental. The attendant will help your guests find the right props, answer any questions, and make sure the booth keeps running smoothly. The attendant will arrive early enough to have the booth set up before the event starts and will take down the booth after the rental period is over. Finest Studios provides a hassle free service that will be tons of fun for everyone. With Finest Studios you can find a booth rental package that will fit nicely into your budget. Finest Studios packages start $495 and have a variety of options. Some of the options include props, customized print layouts, and a digital disk of all the photos. If you want to go high class, Finest Studios will even make doubles of all your prints, create a custom album with the photos of your guest, and upload all the pictures to an online gallery. Finest Studios has worked to bring you the best photo booth at a price you can afford. Watch our demo video and see what makes our Photo Booth different from all the others out there and reserve you date before it gets taken. When we get your reservation request we will email you back to let you know about our availability and what you need to do to lock in your date.